This church which stands north-west of the village of Ashtarak was built in 1281. 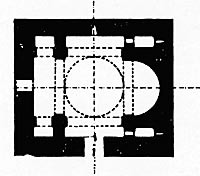 Its ground plan is square on the exterior and cruciform on the interior. The high drum and very tall roof of the dome have an unusual relief decoration. The little bell-tower on the south wall was added in the XIXth century and an unfinished structure dating from the beginning of this century rises behind the church. The building is encircled by a fortified polygonal wall which is almost completely destroyed.